My boys have requested that I make Valentine’s Ladybug cupcakes again so I thought I would share some pics of this cute treat with you. The chocolate cake is from a gluten free cake box and the vanilla buttercream frosting recipe (my all time favorite!) can be found here . I used red sugar sprinkles on the frosting, chocolate chips tip-side down for the spots, gluten free oreos for the heads, mini-marshmallows cut in half for the eyeballs, and left over gingerbread house candies for the eyes and nose. For the antennas, I melted chocolate chips in the microwave, put the melty yumminess in a plastic baggie, snipped the end off and piped the antennas on some waxed paper. Pop the antennas in the freezer until set and then stick them on your bugs. Use the leftover melted chocolate to pipe a line down the middle of your bugs to separate their “wings”. So cute it is almost a shame to see them gobbled up! But to get smiles like this in return, it is so worth the effort! I’d share if you were here, but alas…you’re not. Go make your own. I really like the idea that the face of the ladybug is made of cookie, so cute! I adore watching the pictures! Beth, I love this idea! These are perfect for the ladybug baby shower that I just wrote about on the MyPunchbowl online invitations blog – and linked to your post! Fantastic! Beth, I love these little love bugs! My family has an affinity for ladybugs since my mom died a few years ago. I just had to try to make these. Mine turned out a little different, but they were well received. I am posting on my blog tomorrow with pics of mine and links to your blog and your lovebugs. These are TOO cute! I love the oreos…my favorite cookie. Thanks so much for sharing and enjoy these treats! My 3 year old daughter is sitting on my lap, and she freaked out over these. I guess we will be making them soon. So cute! I am head over heels for these! 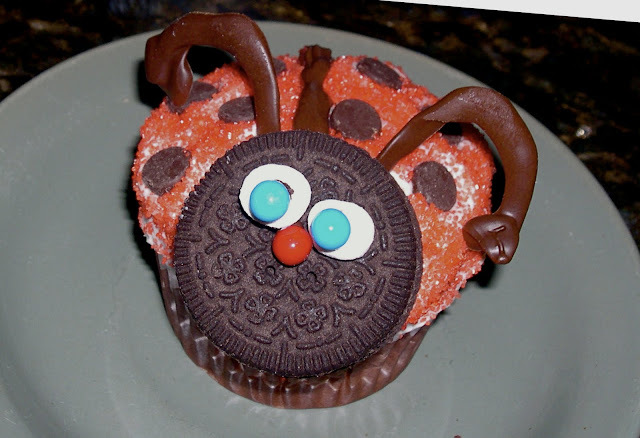 I love cupcakes, and I love ladybugs. How perfect! Precious!!! I know the kids will go crazy over these!!!! Your children are too cute for words!!! These are adorable! Your little eaters are too precious! How adorable! You did a great job! I'd love for you to link up for Cupcake Tuesday! Beth these are TOO cute!! we make valentine cookies over the weekend…cupcakes next week!! Those have to be the cutest cupcakes I have ever seen! Great. These are just the cutest darn things I have ever seen. I was visiting a few blogs from Between Naps on the Porch and came across your blog. How absolutely adorable it is. I love these pics of your boys with the darling ladybugs. I have 7 grandkids and I think these would put a smile on all their faces. I am going to make them for Valentine's Day. I thank you for the wonderful recipe instructions. Thank you sweetie so much. I have signed up to follow your blog. I can't wait to see what you share next. To cute. Please stop over and say hi. I would be so honored to have you follow my blog as well. I love making new friends and finding new blogs for ideas and recipes. Thank you again Ms Beth. Wonderful post. These look soooooooooo yummy….I would eat the entire plate! Will have to attempt them as I know my two little ones would be thrilled to find these on the table for snack time. The cupcakes are very cute…but your boys' faces are even more adorable. You can tell that they just LoVe them! Ok, these are AMAZING and couldn't come at a better time. My daughter's first birthday is coming up next month. I was thinking of doing a lady bug theme (pink and green ones of course…the kind you see in the wild. hehe) because we call her Braya Bug, but we're putting our house on the market and a theme is just too much work for a 1st bday. SO…I think I'll just add these fun little cupcakes and have that be it. 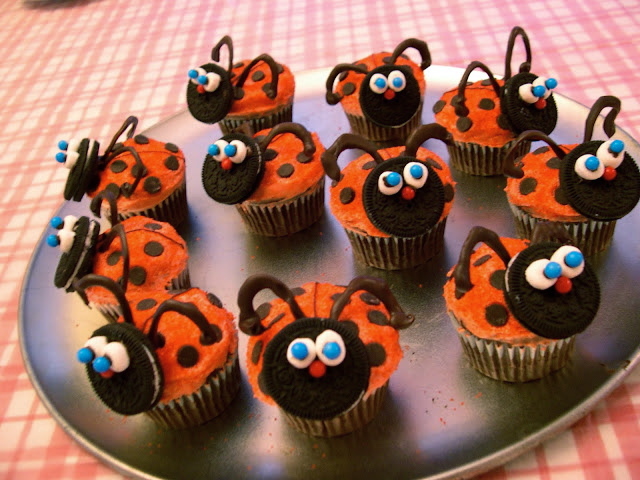 I will say that these are the absolute BEST professional looking ladybug cupcakes. Trust me, I've been looking. I'm SO excited to make my own. 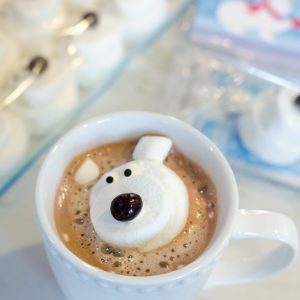 Where can I find little candies like the ones you used for the eyes and nose that aren't leftover gingerbread candies?? ohhh those are the CUTEST cupcakes ever!! Your boys have the biggest smiles, it made me smile! Christian is freaking out saying how cute these are over and over. I think you have him won over for sure! These are super adorable. I really need to try to make them soon. Christian would love it. What a good idea! i am going to have to make some of those for my little ones. they would love those. that is also a fun little snack for a valentine' day party at school. What cute cupcakes! I love it! Those boys are so darn cute! Just look at their faces! These look delicious and I love you for posting a gluten free recipe! : ) I may just make myself some cupcakes this afternoon. Those are adorable! So are your boys! Such good questions you ask! It's fun having someone who isn't from America giving us new perspectives on things we take for granted like s'mores and cupcakes. Yes, cupcakes have frosting and muffins typically do not. I've never seen someone serve a frosting-less cupcake, but I have been served muffins with icing. Muffins are typically served as a breakfast treat and cupcakes are served as a dessert. Muffins also are more notoriously known for having fruit in them and cupcakes typically don't. But, all in all, they are similar :). Yum. Can you please explain to me the difference between a cupcake and a muffin? I have been wondering about it for a long time. Is it just that cupcakes have icing on top and smaller or is it something else? Your boys look so happy! So cute! Darling cupcakes and even more darling boys!!! You are such a sweet Mommy to make those for your sweeties!!! Awesome cupcakes, Beth! The looks on your boys faces is priceless!! Oh my goodness Beth – you made me CRY!!! Now granted, these are ADORABLE and I plan on making them, but honestly – I cried because I had NO IDEA they made Gluten Free oreos. I've been GF for 9 months and burst into tears at the thought of my favorite treat in the world entering my life again!!! *sniff* now to find them here!!! THANK YOU! Those are so cute. My kids are off track from school right now, so we'll have to make some. It will give us something to do for a few hours. Thanks for sharing. Those are adorable! My girls would flip! We tried your french hot chocolate recipe…oh.my. We were all in Heaven! So so good! Thanks for sharing such great things! 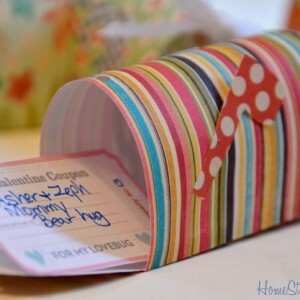 Such a NEAT idea, my daughter would LOVE, LOVE, LOVE these! I might give them a whirl?! Looks good! My kids would love these-I might have to surprise them!